← I met Scrooge. So young and so angry. What would you do if God showed up? And then, over on the shelf near the decorative snowmen, there’s a book that’s different from the other books. We’ve grown up hearing it called “God’s Word.” We’ve heard that it tells us about God and is full of God stuff. But, truth is, we’ve read books on glistening, moody, romantic vampires and mysteries about who killed who in the library with a candlestick while that God book just sat there. Heck, we’ve even read books by authors writing about that book. But, that book? We can’t remember the last time we read it. We read about the secret code of the book and even went to see a movie or two about it. That was cool. Things blew up and conspiracies built up into exciting chase scenes. We sit around and say things like, “I feel like God would feel this way” and “My God isn’t like that.” The book sits. How would your life be different if you really believed that book was the actual words of God? That book written over 1400 years on three different continents by more than 40 authors is different than other books. It is inspired by God. It communicates His heart and shows us what He does. That book is difficult. It cuts me, scares me, encourages me and educates me. If it were a movie, it would be rated R. Sometimes it helps me sleep well and other times it leaves me tossing and turning all night. It is alive. Want to know God? Grab that book. Before you “feel” this or “think” that about God, what have His very words told you? I am learning to love this disturbing, defining, direction-giving book. I am learning that this Holy God is so much bigger than my fortune cookie approach. I am learning that His opinion is often different than mine. And while I still await His direction for the next steps in life, I am learning to be content right where I am now. His book is teaching me that godly men were not as concerned with comfort as I am; they wrote letters from prison cells, hung on a cross upside down or were persecuted. God showed up. 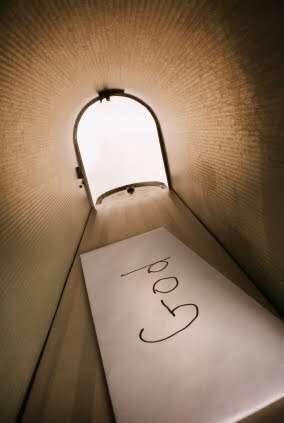 His words are over there on your shelf in that bible with its books of history, poetry, prophecy, songs and biography. I dare you to take it down and turn to Matthew to start reading of Jesus and what made Him tick. Before I speak for God and use Him to elevate my personal agenda, I want to be sure to I know what His Word says. I want to know His Word.